The storming of Magdala, 1868. On a plateau below a great ruined fortress atop a mountain in modern-day Ethiopia a massive cannon lies on its side in the dust. In the royal palace of Windsor a brass plaque set in the Chapel Royal wall commemorates a young African prince. 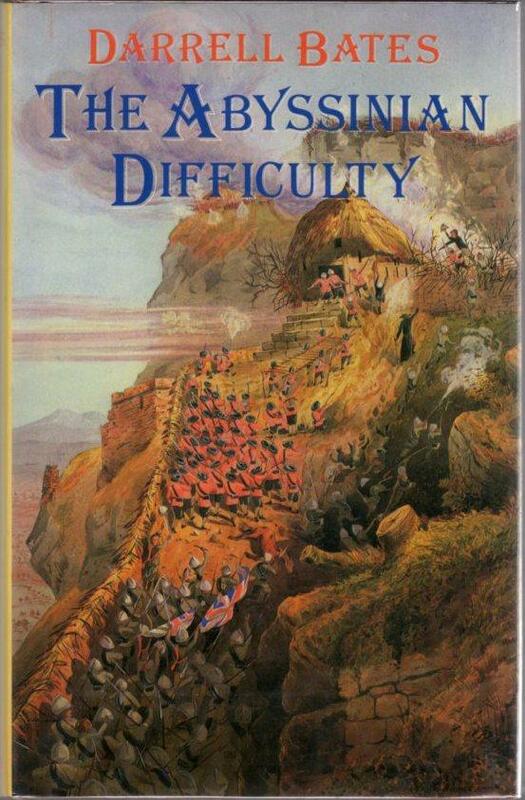 The story that binds them together covers one of the most remarkable military campaigns of the last century. It is remarkable because its commander spared no monetary expense to ensure that none of his men died unnecessarily. His success did much to counter the shameful memory of the cruel shambles in the Crimea. It is remarkable because it mobilized armies from three continents and crossed some of the most savage terrain on earth for one purpose – to free a handful of unappreciative hostages. And it is remarkable for the main protagonist, Kassa – an African Emperor who was fanatically Christian, brave, educated, patriotic . . . cruel, barbaric and, certainly by the end probably raving mad. At the heart of the story is a seemingly impregnable citadel perched on a mountain in the Abyssinian highlands and called Magdala. Kassa, known to Europeans as Theodorus and to his people as Tewodros, Elect of God, the slave of Christ, Emperor of All Abyssinia, was born in 1818. It was a time of chaos and bloody carnage: the power of the hereditary emperors had declined while the barons or rases were out of control and divided the land. Kassa was the son of a local prefect and a peasant woman. When his father died he was sent to a monastery to train as a deacon in the Abyssinian Church which practised an ancient form of Christianity. Surrounded on all sides by Islam, the Abyssinian Church was forgotten or ignored by the rest of the Christian world. His training left Kassa with a profound love of the Abyssinian faith and a sense of his own mystic heritage which were to stay with him for the rest of his life. When his monastery was destroyed in a raid Kassa was one of the few survivors. Aged around twenty, he took to the hills as a guerrilla, already well blooded in tribal warfare. He was by then a notable scholar, a theologian, a fine horseman, marksman and spear-thrower. His wild followers respected his courage and strength and loved his unusual habit of dividing plunder equally with his men. His band caused so much mayhem that in 1845 the region’s governor, Ras Ali, offered terms including the hand of Tewabach, the beautiful daughter of a northern nobleman. They married and Kassa remained devoted to her. Two years later he led a rebellion, snatching control of the imperial city of Gondar. Ali, armed with British guns, tried to wipe out his younger adversary. Both men were by now rival claimants to the vacant imperial throne. After eighteen months of hard campaigning Kassa slaughtered Ali’s army at the battle of Gojjam. Kassa won the support of the Established Church by promising to expel Catholic missionaries. The civil wars continued but Kassa defeated his last rival at Deresye in February 1855. He was crowned King of Kings in a small village church. He chose his new imperial name from the legend of a Messiah called Tewodros who would rescue the country from years of rule by idiots and women. Within a decade he had united Ethiopia under his overlordship, although he still faced encroachments from Egypt and the constant threat of rebellion by the warlike Galla tribe. The first years of his reign were busy and fruitful. He abolished the slave trade and polygamy, with mixed success. He mobilized an army of 60,000 and subdued the troublesome Gallas, snatching their mighty fortress at Magdala. He subjugated the Tigrai province. After one battle he reportedly cut off the hands of 787 prisoners. He was far gentler with those he did not consider rebels, traitors or enemies. He dressed simply and lived in a tent of scarlet and yellow silk among his soldiers. When he was in residence at the palace of Gondar, the tent was pitched in the gardens. He identified with the common people rather than with the rases, whose power he reduced by dividing each province into small administrative areas with his own trusted men in key positions. He scrapped some of the more horrific criminal punishments, such as flaying alive, and simplified the penal code. He was merciless with corrupt judges. His popularity among his troops and the poorer people grew swiftly. So too did the hatred of the rases and judiciary. During his first two years on the throne he was wounded six times in seventeen assassination attempts. He was never seen without a sword and revolver and he walked with a lance in his hand. As he grew older such plots, revolts and insurrections were crushed with increasing ferocity. The Emperor began to believe in his own Divinity. Only three people could with sweet reason calm his rages and curb his excesses: his wife Tewabach; Consul Plowden; and his friend John Bell. Within a few short years all three had died, and their benign influence removed. During these turbulent times tensions grew between the Abyssinian Church, which had followed its own separate path for centuries, and Catholic and Protestant missionaries from Europe. Tewodros tolerated the missionaries as long as their missions included artisans who could bring with them such skills as mending firearms, making gunpowder and building roads. In 1858, when his beloved wife was stricken with illness, he viewed with gratitude the sadly unsuccessful efforts of mission doctors to save her. He rewarded them with land to build more homes and a school. The missionaries he liked and trusted the most were Swiss and German craftsmen. He promised they would never be ‘molested or tormented’ but at the same time warned them not to try to convert his Christian subjects. Early in 1860 Consul Plowden was speared to death, reportedly by a runaway nephew of the Emperor who had joined Tigrai rebels. In a long apologetic letter to Queen Victoria, Tewodros told how he had pursued his young relative and his supporters and killed them all, ‘. . . not leaving one alive although they were of my own family, so that, by the power of God, I may get your friendship.’ Plowden’s death plunged Tewodros into a black despair which must have accelerated his decline towards insanity. His second wife, Terunesh, was comely but haughty and treated him like a peasant unworthy of her royal pedigree. The slide was mental, emotional and physical. He caught an unspecified disease of a ‘peculiar and formidable nature’. He even suffered a broken leg. Excessive drinking and debauchery exposed the darker side of his nature. Plowden’s successor was Charles Duncan Cameron, a veteran of the Zulu campaign and a former diplomat to the Russias. He arrived with a goodwill letter from the British Government and a gift from Queen Victoria – a matched pair of engraved revolvers. After some delays Cameron was granted an audience with Tewodros in 1862. The Emperor received him ‘in a reclining posture, with a double-barrelled gun and two loaded pistols by his side’. Despite his threatening appearance Tewodros treated the consul with kindness, although he also made it quite clear from the start that he could never replace Plowden in the royal esteem and affection. Later that year Tewodros wrote a round-robin letter to the British Queen, the French Emperor and the Russian Tsar. It included an attack on Islam in general and especially on the Turks occupying much of coastal Ethiopia. He suggested a Christian alliance against his Moslem neighbours. In the version sent to London he specifically asked permission to send his own envoys to explain at first hand how the Turks were oppressing good Christians. Cameron was given precise orders to deliver the letter to the queen but instead relied on a string of messengers and it arrived in London early in 1863. By then the Foreign Office was incensed by its belief that Cameron was meddling in internal Abyssinian affairs. A combination of bureaucracy and bloody-mindedness left the Emperor’s letter gathering dust in some Whitehall pigeon-hole. After eight months Cameron had no reply to convey. The French were a little more diplomatic – but only just. Tewodros found a convenient excuse to imprison the French consul, Lejean, until he received a reply. When it came it was signed not by Napoleon III but by his foreign minister. Tewodros stormed: ‘Who is that Napoleon? Are not my ancestors greater than his?’ Nevertheless he released the French consul, who, once safely across the border, let loose a flood of abuse against Tewodros, with little thought for those Europeans who remained within reach of the Emperor’s wrath. Into this explosive situation bumbled Henry Aaron Stern, a German missionary from the London Society for Promoting Christianity Among the Jews. A volatile and self-important character, he was unpopular among the other missionaries. During an audience with a heavily drunk Tewodros one of Stern’s interpreters committed a blunder. Tewodros ordered that unfortunate man and another servant to be flogged so wickedly that they died. When the horrified Stern objected he was beaten unconscious and imprisoned. His baggage was searched and letters were found in which Stern and his colleague Rosenthal were critical of the Emperor. A book of travel writing by Stern included the insulting claim that Tewodros’ mother had sold medicine for tapeworm. The two missionaries were chained up and their servants shackled to wooden yokes. Meanwhile Cameron, embarrassed by London’s tardiness, tried to steer clear of further trouble. It did him no good. Tewodros came to believe inaccurate reports that Britain and France were moving to support Turkish and Egyptian claims to Abyssinia’s northern territories. The British consul and some of his staff joined the missionaries in chains. Rassam and company spent a pleasant month enjoying lavish court hospitality until the hostages were brought to them on the shore of Lake Tana. There were eighteen prisoners: Cameron and four of his European servants; five German missionaries: Stern, Rosenthal, Martin Flad, Staiger and Brandeis; the French messenger Bartel; two natural history collectors; the European wives of Flad and Rosenthal and three Flad children. Stern and Cameron, whom Tewodros had grown to detest, were in very poor physical condition. Rassam, who realized his task was not complete until they were across the border, was determined that the captives should not come face to face with their imperial gaoler for fear of infuriating him again. He sent them on a roundabout route towards the border while he and his party crossed the lake waters by boat to pay their respectful farewells. They were ushered into the royal tent, only to find the throne empty. While Tewodros watched from behind a curtain the emissaries were seized. On the other side of the lake Cameron and the rest were again taken captive. Tewodros claimed that Rassam had tried to spirit away the Europeans before they had formally made their peace. He also suspected that they would follow the Frenchman’s example and shower him with abuse once safely out of range. But the chief reason for his action must have been the Europeans’ continuing value to him as hard currency. In another letter to London he held them openly to ransom in return for the skills, arms and equipment he needed to bring his divided, feudal country into the modern age. He specifically asked for ‘a man who can make cannons . . . and an instructor of artillery’. The letter was delivered by Flad, who was forced to leave his wife and children behind as surety. The Earl of Derby’s new Conservative Government agreed to many of the Emperor’s demands. A list of willing artisans was drawn up, including a gunnery sergeant. Six-pounders from Aden and arms worth £500 were collected as ransom, together with telescopes, field glasses and ornamental tumblers. A civil engineer and six technicians were sent towards Massawa before they were halted by disturbing reports. At first the hostages had been treated well, especially the women. But then Tewodros set off on a series of marches to re-establish control over troublesome tribes. Cameron, Rassam, the original captives and some more were sent to Magdala where conditions were primitive and harsh. Three days later they were placed in chains. Blanc described their physical mistreatment as a great torture. Both he and Cameron were later accused of exaggerating their hardships. Rassam, who was proving himself to be a cool and courageous man, later wrote: ‘Not one of the captives can justly complain that his imprisonment . . . was aggravated by privation. Nevertheless the chains were a great indignity for the Europeans even though their hands were free and their movements not seriously curtailed. They must have suffered considerable mental anguish when they considered that they were at the mercy of an unstable and unpredictable host.’ Britain’s Resident in Aden called for a rescue expedition. For a while the Cabinet resisted such pressure, despite growing public opinion and letters from the hostages themselves which suggested the Emperor was becoming madder by the day because of ‘hot baths and concubines’. Finally Tewodros was given a three-month deadline to free the prisoners. The ultimatum went unanswered. Tewodros was being threatened on all sides by internal revolt, desertions from his army and disputes with the Church. He seems to have convinced himself that the surest way of uniting his kingdom was to provoke a British attack which he could then claim was backed by Abyssinia’s old Islamic foes. The Cabinet suspected such motives but agreed that Britain and her subjects could not be so abused. They were anxious, too, for a demonstration of British military power to dissuade the Russians from any encroachments on India. Chancellor Benjamin Disraeli proposed an extra penny on income tax to raise the £2 million thought necessary for a punitive expedition. All that was left was to find the right commander. Lieutenant-General Sir Robert Cornelis Napier had been born a soldier. His middle name commemorated the 1810 storming of a fort in Java in which his artilleryman father had died. He was born that same year in Ceylon and after an English education sailed to India as an eighteen-year-old lieutenant in the Bengal Engineers. For the first seventeen years of his service he saw no action but built roads and bridges, painted, wrote poetry and collected rock and plant specimens. His devotion to art never left him and he was still taking lessons at the age of seventy-eight. That relatively peaceful life was shattered by the First Sikh War in 1845. Twice, in the battles of Mudki and Ferozeshah, horses were shot from under him. In the second engagement he continued his charge on foot until badly wounded, although his injuries did not stop him fighting at Sobraon. He saw more action in the Second Sikh War and in 1852 led a column in the Black Mountain expedition on the North-west Frontier. In the Indian Mutiny he saw both the first relief of Lucknow and its final capture. There was more fighting against rebels in Oudh and Gwalior and in 1860 he commanded a division in the China War. He had fifteen children by two wives. He excelled, too, at innovation and administration, bothering himself with such unglamorous but vital matters as camp latrines and the good health of his men. He was fifty-seven and the Commander-in-Chief of Bombay when he received orders to lead the Abyssinian expedition. Napier realized from the start the enormous scale of the task facing him. The Foreign Office had envisaged a speedy dash into the wild Ethiopian heartlands, the snatching of the prisoners from an ignorant barbarian, and an equally swift withdrawal. The Duke of Cambridge suggested ‘a flying column should be pushed forward . . . and finish the business before the rains set in’. The Cabinet certainly did not want an extensive, and therefore expensive, campaign. Napier knew better the logistical problems of fighting in hostile, rugged and largely unknown terrain. He believed that a flying column would simply be swallowed up and its men would perish in unnamed ravines. Instead he made detailed plans for a steady march with all supply lines defended. Given his glittering and successful campaigning career it would have taken a foolish man, even in the Cabinet, to contradict him. He got what he wanted. His force was made up of 13,000 British and Indian soldiers – cavalry, infantry and sappers. The troopers included the 23rd Regiment of Foot, better known as the Duke of Wellington’s. Its commander was Alexander Dunn who had won the Victoria Cross in the Charge of the Light Brigade. His men were largely Irish with a reputation for hard drinking and harder fighting although they included a good number of Germans who had signed on for the Crimea and never went home. The British troops and some Indian cavalrymen were armed with the latest breech-loading Snider rifles which had proved their worth in the American Civil War. The rest of the Indians, in line with Army policy since the Mutiny, carried the less efficient Enfield muzzle-loaders or the even older smooth-bores. In addition to the active soldiers there were over 8,000 auxiliaries: cooks, teamsters, grass-cutters, animal handlers and camp-followers. There were also eleven journalists, one of whom was Henry M. Stanley, yet to become famous for finding Livingstone, as well as a metallurgist, a geologist and a zoologist. The livestock amounted to 36,000 beasts, horses, mules, bullocks, beef cattle, camels and 44 elephants. Supplies included 70,000 lb of salt beef, 30,000 gallons of rum, 3,000 tins of condensed milk, 250 dozen bottles of port wine, 800 leeches in the medical carts and, especially for the Sikhs, a ‘certain quantity of opium’. The traditional reds and blues of the British uniforms mingled with the new and much more suitable khaki. The gaudy tunics of the Indians contrasted with the drab workclothes of Arabs, Africans, Turks. All struggled in the dust and the heat to bring that mobile city ashore. A score of languages competed with the braying of mules, the whinnying of horses, the trumpeting of elephants. In charge of all this organized mayhem was Major Frederick Roberts, a veteran of the Umbeyla expedition. It is a measure of the efficient job he did that, although he was to see no action in the campaign, Napier recommended him for a brevet lieutenant-colonelcy. It was another illustration of the prudent and methodical way Napier was determined to conduct this African adventure. Memories of the tragic waste of the Crimea were still vivid. Napier was determined that such cruel inefficiency would not be repeated. He pestered London for more food and clothing before he would move out of his bridgehead. He busied himself with every detail, from the holes in his men’s socks to camp sanitation which, one of his officers sniffed, was ‘one of his pet hobbies’. He saw that dead mules were quickly replaced with fresh shipments, that sappers improved the roads, that a 10-mile military railway was built across a nasty stretch of coastal desert. Napier was criticized for his lengthy and detailed preparations. He brushed that aside and dismissed more talk of flying columns as dangerous, romantic nonsense. He had seen a lot of blood during his career. He was determined that not a single man would die because of his neglect. Christmas dinner that year was guinea fowl shot in carefully placed rows to conserve ammunition. Meanwhile the hostages at Magdala were kept in two crude huts within the imperial compound at the heart of the mountain stronghold. After a few months they had turned these hovels into substantial homes with bedsteads, furniture and carpets given to them by Tewodros. Food was supplied by friends and relatives on the outside, augmented by tomatoes, potatoes and greenstuff from a garden and vegetable patch they planted themselves within the walls. They were weakened by the poor quality of some of their food, bored by the lack of variety, but they were far from starving as some of their champions had claimed in the British Press. Indeed they may even have fared better than their guards. Those on the outside kept them informed through posted letters and clandestine messages. The first news they heard of a rescue expedition came shortly before Christmas. Any joy they might have felt must have been dissipated by news of Tewodros who had been away campaigning for a year. He and his army were on the move again, and heading towards Magdala. The war was to be a race to see which commander would reach them first. Tewodros had failed to suppress the rebel tribes and his power was fading. He now gambled everything on beating the British in a glorious war. He told Martin Flad, who had risked the royal wrath by rejoining his family in captivity, ‘I asked them for a sign of friendship which is refused to me. If they wish to come and fight let them come. By the power of God I will meet them and call me a woman if I do not beat them.’ His Swiss and German artisans manufactured cannon and artillery pieces including a great mortar capable of propelling a 1,000-lb ball. He named this 7 ton monster ‘Sebastopol’. It was the most cumbersome part of the army Tewodros led from Gondar towards Magdala. After desertions he was left with 5,000 fighting men, over 40,000 baggage-handlers, drivers and camp followers, the European craftsmen who still served him for pay, and several hundred native prisoners captured in his domestic wars. They made painstakingly slow progress through some of Abyssinia’s wildest terrain. On the approaches to the high plateau of Zebrite thousands of men hacked and blasted a zigzag road for the new, prized artillery in which the Emperor placed so much faith. A contemporary engraving shows hundreds of men hauling Sebastopol with ropes while others placed logs and stones behind its wheels. Tewodros worked passionately alongside his workmen, lifting rocks with his bare hands. While this road was being constructed he heard the first firm news that the British were on the move. He said ironically: ‘We must be on the watch as I hear that some are come to steal my slaves.’ His toughest task was the crossing of the Jidda gorge, a deep gash which bisected the central highlands. 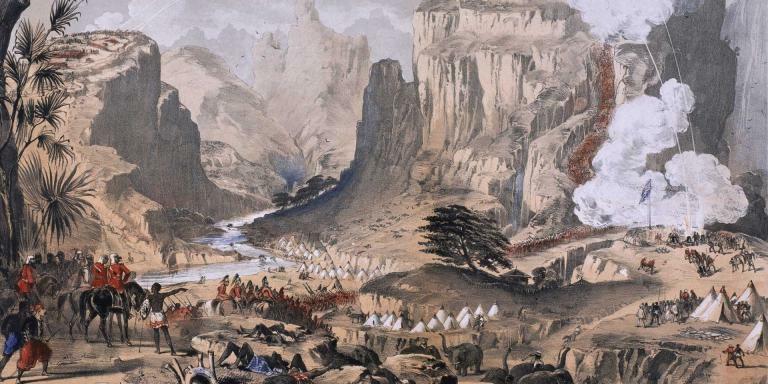 It took eighteen days to cut a route to the floor of the ravine and another three weeks to scale the other side but by 20 February 1868 his entire army, including Sebastopol, was on the fertile plain of Delanta. Napier had decided to divide his force into two separate parts. The larger division was to garrison and protect the long lines of supply and communications between their coastal bridgehead and their target. The smaller division, consisting of 5,000 fighting men, was to be the main striking force. Advance parties set up a base 70 miles into the country at Senafay. As fresh troops reached it the first group, now rested, went forward to the next stepping stone at Guna Guna. In this methodical fashion the unwieldy army advanced in good order until the whole column was on the move. Napier aimed to take full advantage of the widespread discontent with Tewodros’ rule and to win allies among the local barons, the rases who had their own reasons for hating the Emperor. These included Ras Kassai of Tigrai, a thirty-year-old warlord. In delicate negotiations Napier enlisted the aid of Captain Charles Speedy, who had first gone to Ethiopia to shoot elephants and who had once been part of Tewodros’ entourage. He was 6 foot 6 inches tall, wore a bushy red beard and impressed the tribesmen with his ability to split a sheep along its backbone with one sweep of his sword. He spoke fluent Amharic and always wore native robes. Speedy used his inside knowledge of Ethiopian politics to steer the British commander through a minefield of tribal allegiances and vendettas to secure promises of safe passage through Tigrai, supplies and intelligence. By the end of January the British force was spread over 100 miles, the strike ‘head’ to the front, its long ‘tail’ guarding the supply lines back to the coast. Ras Kassai and the other barons could only be trusted so far. The Europeans found the march easier than had been anticipated. They followed the crest of a watershed – rough going but not brutal for troops hardened in the boiling cauldrons of Afghanistan, India and Aden. They marvelled at pyramid rocks, fantastic stone columns, castles for giants with which nature mocked the puny efforts of mankind. Professional reportage and personal journals describe sheer precipices, gurgling crystal-clear torrents, the flowering of roses, violets, jasmine, the blurred wings of hummingbirds. The weather was clement but that would not last. Napier, who reached Adigrat on 6 February, knew he had to speed the march up if he was to complete his mission and bring his men back before the unbearable heat of July. At roughly the halfway mark the main strike force of 5,000 men had with it 1,356 horses, 518 regimental mules, 33 elephants, 1,969 camp followers, more than 5,000 baggage mules and 1,800 muleteers. Napier sent servants and many camp followers back to base with much of the baggage he deemed luxuries. There was much grumbling when he reduced the baggage allowance, even for officers. But the army’s pace stepped up noticeably and began to average 10 miles a day. Two days ahead of the main force was a reconnaissance and pioneering party under Colonel Phayre. Napier led the vanguard of around 1,000 men, equally split between British and Indian. Then came the main strike force while the steady reliable elephants brought up the rear.